Our office has a board certified Oral Surgeon on staff. He is board certified in the treatment of diseases, injuries and defects involving both the functional and esthetic aspects of the hard and soft tissues of the head, mouth, teeth, gums, jaws and neck. Treatments offered involves, but is not limited to: dental implants, wisdom teeth removal, apicoectomy, TMJ disorder, facial trauma, corrective jaw surgery, oral pathology, osseous tissue surgery, anesthesia and bone grafts. 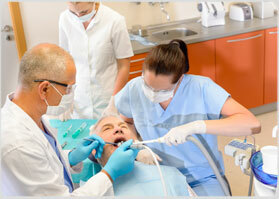 For patients that possess a very high dental phobia IV sedation (twilight sleep) is available. Call our office and ask for an Oral Surgery consultation. Accepting PPO dental Insurance plans, Humana Medicare and Coventry Medicare. We do not accept HMO dental insurance plans.